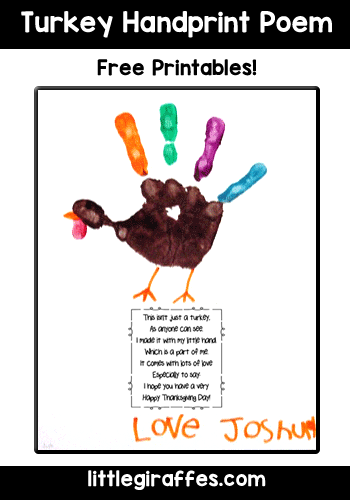 I have added some new Turkey Handprint Poem Printables for this craft at A to Z Teacher Stuff. You can choose from a few styles. This is a tiny little sack. Inside you’ll find a popcorn snack. To say you’re always in my heart. Use eyedroppers to drop colored water (from food coloring) on to a coffee filter. While this filter dries, glue colored feathers along the upper rim of a second filter. Glue the colored filter over the plain filter, sandwiching the ends of the feathers between. Glue on a circular head, wiggle eyes, waddle, beak and feet cutouts. Use brown construction paper for a body, red for the head, and orange for the legs and beak. Cut out the pieces. Glue the bottom of the head piece to the body piece. Fold the beak in half and glue one side to the head. Glue on wiggly eyes. Attach the legs to the back of the bottom of the body. Glue this note to the front of the body section after creasing the wings forward. Cut a toilet paper roll in half and hot glue it to the back of the body section to enable the turkey to stand up. Buy colorful napkins and stuff the napkin (fan it somewhat) into the toilet paper roll to serve as the turkey’s feathers. OK, so the napkin holder below is pathetic, but he has been living in a box in my basement for years. Pretend he has 2 eyes, a poem on his tummy and a colorful napkin sticking up behind his head. At least you get a visual–kind of! I send home a turkey blackline and ask the students’ families to help their child decorate the turkey. It’s always amazing how creative they are, using beads, paint, cereal, glitter paint, pasta, colored popsicle sticks, silk leaves, pompoms, feathers and fun foam shapes. Last year I even had a football player turkey! For quilted squares, children glue precut pieces (1 and one-fourth inches square) over a quilt pattern. A decorated die-cut turkey was glued in the center. On the other square, the children tell what they are thankful for and draw a picture of it. Trace two of the turkey bodies. Draw on a wattle, beak and eye. Cut 4 colorful feather strips 2 inches by 12 inches. Staple turkey together at heand and back. Fold feathers and glue on each side of the turkey’s back. Children watercolor the turkey bodies. Glue a photo of each child on for the turkey face. Children paint a wood block (a 2×4 cut into approximately 8″ lengths) brown. Silk flower leaves are hot glued on for the tail feathers. Washers painted white are glued on for eyes. Felt is used for the beak and wattle. Paint wooden spools brown and slip them on to a 2″ wide strip of fabric (approximately 24″ long). Tie a knot at each end. Finally, a knot is tied in the middle of the strip and it is hot glued to the bottom of the block for the turkey’s legs. These two pieces are cut and then painted. They fit together so the turkey is free-standing. The parent letter below combines ideas contributed by Sharon (FL) and Cathye (TX). It’s time to have fun creating a very unusual bird. 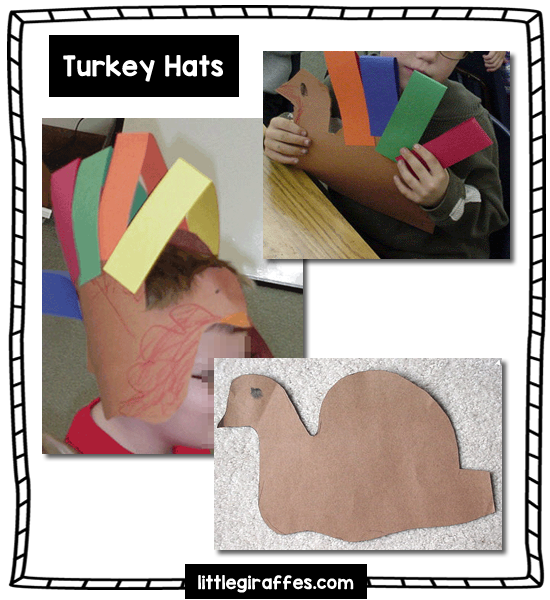 As a family, disguise Tom Turkey so that he won’t be eaten for Thanksgiving! You may choose to dress your turkey as a doctor, an astronaut, a farmer, a cheerleader, a ballerina, a clown, etc… Be creative and use any materials you have at home. Everyone gets to help. Cut out the enclosed turkey and mount him on cardboard or heavy paper. Make it very original and have fun! Please, help us save these turkeys! The turkey homework is due on Tuesday, November 18, but you may send it in earlier. When your Tom Turkey is incognito, he can “hide out” in our classroom! And I’m afraid as I can be. So you won’t catch me. Thank you for having a free template,most sites you have to pay. I am so grateful. Happy Thanksgiving. You’re welcome! I will continue to add more free printables to the site as often as I can. Thank you for visiting! I truly appreciate how you share your ideas and on top of that, take your time to post! My mother in law, also a teacher, always impressed upon me that good teachers share their ideas and work together for the good of the students. She would love and appreciate you, too! Thank you for your kind comments, Theresa! I agree! Mrs. Flanagan, the founder of Little Giraffes, started a wonderful resource and countless students have benefited from it. My own children completed many of the activities from this site in preschool and kindergarten. I plan to continue expanding and improving the resources here.